Is the use of an isolator beneficial for the asepsis and profitability of an intensive production? The development of Advanced Therapy Medicinal Products (ATMP) under product-oriented integrated laboratory working stations enclosed in isolators, leads to both a superior asepsis grade and the integrity of the procedure, when compared to the traditional laboratory-oriented clean room approach. Increased interest in this field poses additional questions when moving to extensive GMP manufacturing for clinical use. This move will require cost reduction and procedure optimization in order to fulfill an extended demand with profitability. An isolator approach is beneficial for the entire procedure not only for asepsis (referring to the quality of the products delivered), but also in terms of operational costs, personnel working conditions and operators’ time. These aspects benefit overall performance, which ultimately affects process profitability. The debate on clean rooms vs barrier isolators in the aseptic production of non-sterilizable pharmaceutical components is a well-established trend. If we look at what is recently happening in pharmaceutical production, new installations are substantially choosing the isolation approach, and old installations that need revamping are developing bridge solutions that allow a reduction in high-grade classified areas. Aseptic manipulation and sterility of the final product is an even more challenging issue when dealing with ATMPs (Advanced Therapies Medicinal Products). The production of these products starts with or usually includes a sample from a biopsy taken in an operating room, which in itself is a step at risk of contamination. The preparation is then subject to expansion with the use of externally introduced growing media, in an environment favorable to the development of any existing microorganism. The final product is then directly administered to the patient without any additional sterilization process. It is clear that recent developments and continuing growing interest in the so-called “regenerative medicine field” are constantly presenting additional asepsis challenges to existing and new players. Despite the availability of isolation technology and its recognition as a top-class technology for aseptic manipulation for many years now, in the field of Advanced Cell Therapies the large part of the existing manufacturers and the advanced R&D laboratories are still approaching the problem of aseptic processing with the use of clean rooms. The reasons for this probably stem from a vision of the stakeholders which is people- and laboratory-oriented (as opposed to product-oriented), originating from the historical process which brought researchers to see the clean room as a natural extension of the labs where they started doing their initial experiments. Different, more restrictive considerations arise when going from the production of a few samples per month to extensive manipulation and manufacturing under GMP recommendations (even the production of enough batches to perform a Phase II study). Procedure scalability is of the utmost importance to have the ATMPs available 24/7, in the right quantities and for all the patients who need them. We should be able to “adapt” production to the increasing needs, without changing the quality level of the delivered products. Moreover, a non-secondary requirement concerns sustainability, i.e. the possibility to have the products at a cost which is similar or comparable to that of existing alternative treatments, in order to allow healthcare systems to profitably reimburse them. Scalability and sustainability are clearly interdependent and concerned with the possibility of increasing the optimization of the entire procedure. This involves initial investments, continuing capital expenses, consumables, personnel costs and all the operational expenses which will reflect on the final product cost and, ultimately, in the profitability of the delivered product. According to ISO 14644-1, a clean room is “a room in which the concentration of airborne particles is controlled, and which is constructed and used in a manner to minimize the introduction, generation, and retention of particles inside the room and in which other relevant parameters, e.g., temperature, humidity, and pressure, are controlled as necessary.” Critical parts of the operations (such as open work manipulations) are performed in a restricted area where a unidirectional airflow cabinet is typically installed and where the Class 100 (Grade A, according to EU classification) is maintained even in operation. Is there a way to have the same conditions replicated in a smaller environment, able to guarantee any aseptic standard in a single enclosure? Today technology offers a superior barrier system, better known as the isolator system. An “isolator” is a structure that is sealed and supplied with air through a microbial retentive filtration system (HEPA minimum) and may be reproducibly decontaminated using H2O2 technology. When closed, it uses only decontaminated interfaces (where necessary) or Rapid Transfer Ports (RTPs) for materials transfer. Special purpose-built openings, designed and validated to preclude the transfer of contamination, allow for the egress of materials to be delivered. Given the proof of the superior performance of the isolator system in terms of process asepsis, we turn to answering the crucial question of benefits and convenience for the entire procedure: do these benefits and advantages result in savings and optimization practices, which can lead to an increase in process profitability? To answer the question, we will look at several categories: installation costs, ease of use, validation costs, sanitization costs, and energy consumption. Isolators may seem an additional cost, since the clean room is a constant in existing environments. For this reasons, we have limited our comparative analysis to new installations, based on a 4 glove isolator (with integrated laboratory equipment needed to perform cell culturing) versus a small size (40 square meters) clean room. These parameters correspond to a volume of approximately 2 cubic meters for the isolator and approx. 120 cubic meters for the clean room. We also hypothesized a turnover of 40 operating weeks per year. If we look at installation, building a clean room from scratch is surely more challenging: the complexity of the structures, the annexes, the required materials, the airflow management, etc. An isolator is a complex structure too, but the complexity moves from the facility to the factory, and it arrives at the installation site almost ready to use. Moreover, given the number of working places needed, there is an enormous difference in terms of dimensions, which makes isolation technology an advantage in terms of space occupancy, reduction of the classified area, and services to be connected. In our analysis,the two installation costs can be comparable. An isolation system dedicated to Advanced Cell Therapies can take several weeks to validate, which, considering the complexity of structures, materials, airflow, etc., is not out of line with other clean room facility installations. Therefore, we also found that validations costs are comparable in our analysis. Once isolator structures are validated, cleaning and cleaning validation for isolators is not particularly burdensome. Internal surfaces are built so there are no recesses, all corners are large-radius rounded corners and the interior is all made of mirror-brite 316 L stainless steel. Sanitization is performed just by running the VPHP cycle. On the other hand, cleaning and sanitization of a clean room needs several hours and a couple of sterile-gowned specialized workers using a variable set of cleaning and disinfecting products. In the hypothesis described above, we have evaluated a total saving in cleaning and sanitization of 5000-6000 EUR per year in the 40 weeks operations scheme, also including costs for HEPA particle filtration. The protection equipment to allow product manipulation is classified under “gloves and gowning”. According to the hypothesis above, by providing two glove exchanges per year and appropriate gowning for production and maintenance according to the planned data, the saving is about 2000 EUR per year. Additionally, and in line with common practices, the estimated gowning and de-gowning time is 40-45 minutes per worker per shift. In the proposed scheme, this accounts for total savings of 12500 EUR when performing the same tasks in an isolator. The most significant difference between the two approaches is that an isolator system only needs decontamination and pressurization when in production, while regular clean rooms must be maintained all the time. Furthermore, considering the volume differences, we have evaluated the air exchange volume needed and the corresponding power consumption at typical commercial costs. Without taking the extreme values (which would result in an unbelievable advantage for the isolator approach – for this clean room evaluated at 40 weeks instead of 52), we believe the realistic difference to be in the order of 10 times: 2000 EUR for the isolator approach, 20000 EUR for the clean room. 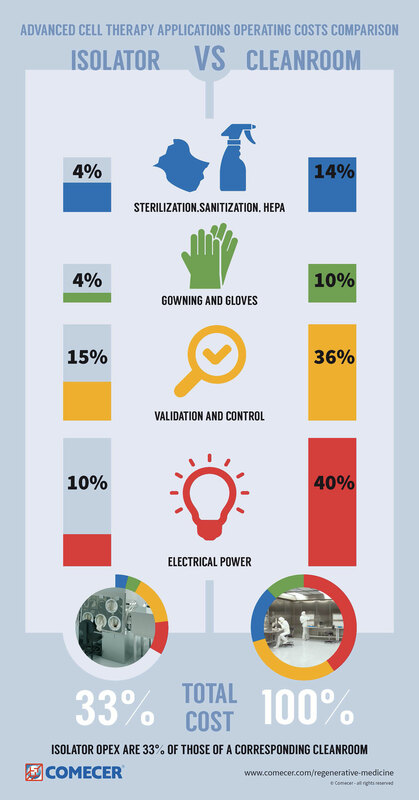 A rough sum of the data results in the yearly operational costs of an isolator (sanitization, HEPA filters, gowning and gloves, validation & controls, power supply) in the order of one-third of the cost of running a small size clean room. In absolute values, this is approximately 20.000 EUR/USD of operational costs per year in the isolator hypothesis, 70.000 EUR/USD in the clean room environment. Additional savings come from the gowning and de-gowning times, not included in this sum, which represent an additional advantage for the productivity of the site. In conclusion, we can state that the clear trend taken by the pharmaceutical production, moving away from larger classified spaces toward maintaining ultra-clean stations wherever appropriate, is also suitable for ATMP production. Greater sterility assurance and cost savings are most often reported as reasons for deploying isolators, either within clean rooms or instead of them. Air pressure differential, small footprint and relative ease of decontamination (compared with clean rooms) make a good case for the superior sterility assurance potential of isolators, when used in aseptic mode. Furthermore, consumables, cleaning and validation costs, along with operator’s time and operator’s working conditions, are best in the isolator approach compared to the clean room approach, thus contributing to the critical goal of procedure optimization and reduction of the final product cost.